GX 470 model it replaces. The 2010 GX 460 achieves all of these significant developments while its segment-leading 10 standard airbags and the available Pre-Collision System help enhance safety. The 2010 GX 460 combines “right sized” midsize packaging with family-friendly comfort and premium craftsmanship. The GX 460 is unique with a standard seven-passenger configuration built upon a rugged body-on-frame construction; it is also standard-equipped with full-time four-wheel drive and the advanced Kinetic Dynamic Suspension System (KDSS) to help provide both exceptional on-road ride and handling and true off-road capability. The 2010 Lexus GX 460 is powered by an all-new 4.6-litre V8 that is 14 per cent more powerful and 11 per cent more efficient than the 4.7-litre V8 it replaces. The new engine produces 301 horsepower and 329 lb.-ft. of peak torque, gaining 38 more horsepower over the previous generation. It is teamed to a new six-speed automatic transmission with sequential shift. Combined city/highway fuel consumption improves by 11 percent to an estimated 12.1L/100km (vs. 13.6 in the 2009 GX 470) -- better than other V8 luxury utility vehicles and competitive with some six-cylinder models. The GX 460 has an estimated 14.1L/100km rating in the city and 9.8L/100km on the highway. 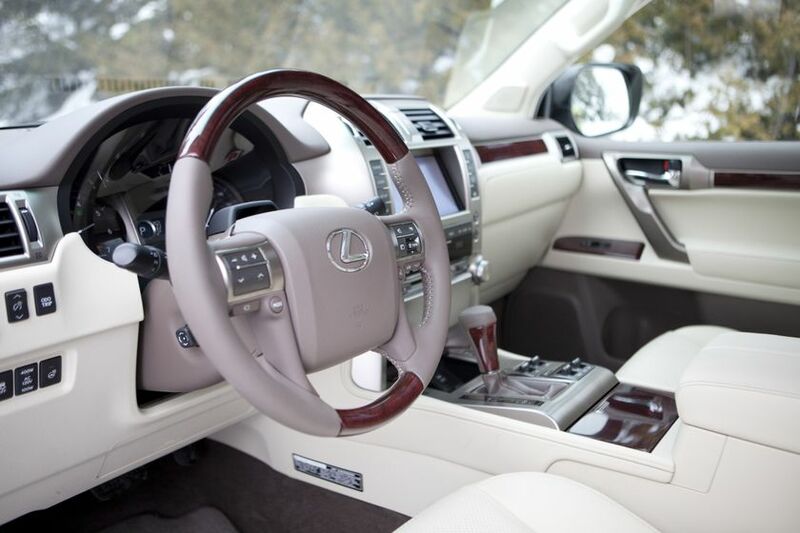 The 2010 GX 460 provides an even more versatile interior. The second row seat slides 104.1 mm (4.1 inches) fore/aft to maximize passenger and cargo carrying ability. The foldable and reclining second row seats also feature a 60/40 walk-in function to access the standard power fold-flat third row seats; a Lexus first. The rear door window uses a flip-up glass panel for added convenience. The 2010 GX 460 Premium luxury SUV features standard heated and ventilated front seats, a power flat folding-third row seat, automatic high-beams and automatic headlamp levelers, a front and rear clearance sonar, variable speed power windows, smart access key, back-up monitor, hard disc-based navigation system, a 17-speaker Mark Levinson Surround Sound Audio System, and more, and carries a manufacturer’s suggested price starting at $68,500. For even greater luxury, the Lexus GX 460 Ultra Premium adds a pre-collision system with driver monitor camera, lane departure alert system, heated wood-trim steering wheel, semi-aniline leather, a four-camera around-view monitor, rear air suspension with auto leveling system, crawl control, off-road package with guidance, and more, and starts at a manufacturer’s suggested price of $77,500. 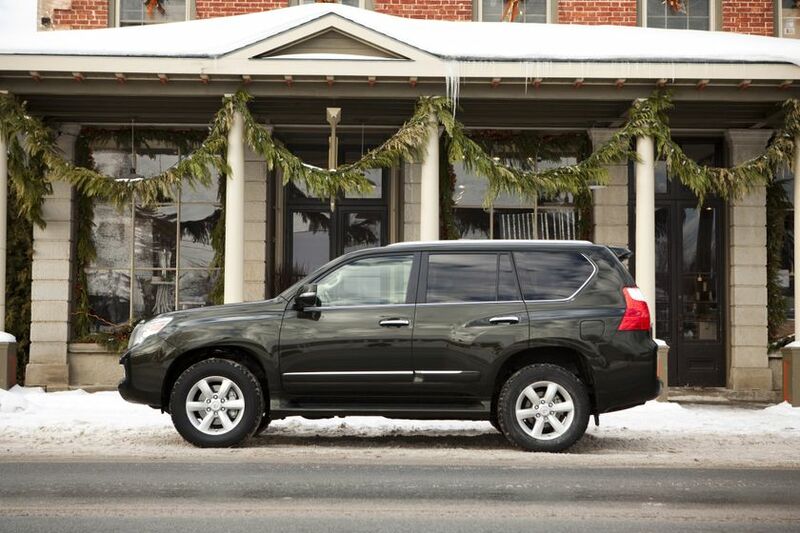 The 2010 Lexus GX 460 is on sale now at Lexus dealerships across Canada. The 2010 GX 460 takes its model designation from an all-new 4.6-litre V8 engine. The new 32-valve DOHC engine features aluminum alloy cylinder heads and block with dual Variable Valve Timing with Intelligence (VVT-i), which controls valve timing and overlap on both the intake and exhaust camshafts to optimize power, fuel efficiency and emissions. (The previous 4.7 had VVT only on the intake camshafts.) Peak torque is also up for the new 4.6, now 329 lb.-ft. at 3,500 rpm vs. 323 lb.-ft. at 3,400 rpm for the 4.7-litre engine. The new 4.6-litre V8 is teamed to a new six-speed electronically controlled automatic transmission, compared to a five-speed automatic with the previous generation, benefiting both performance and fuel economy. The new transmission fits in the same space as the previous five-speed and features a higher top gear ratio. The new powertrain helps make the 2010 GX 460 feel more responsive in everyday driving and quieter than the previous model. The 2010 GX 460 retains the same 2,948kg (6,500 lb). towing capacity as the GX 470 offered. The 2010 Lexus GX 460 is one of the few premium brand luxury utility vehicles that can deliver genuine trail driving capability. Combining that capability with Lexus luxury and on-road performance makes it even more exceptional. Lexus studied vehicle usage of current owners and found that many use their GX models for family hauling during the week and vacations and camping trips on weekends. Whether towing a watercraft or navigating areas with unpaved and rugged trails, the GX 460 is capable yet refined. The 2010 GX 460 has robust body-on-frame construction and does not compromise on- or off-road performance; the high-strength chassis and dynamic suspension control technology support both. A standard 4 and 7-pin trailer wiring harness is ready to convert the week day commute to more adventurous weekend activities. The power rack-and-pinion steering system helps make it easier to maneuver the GX 460 in tight spaces. Available Rear Adjustable Height Control (AHC) enhances the vehicle’s flexibility in a wide range of driving situations. In addition to KDSS, the 2010 Lexus GX 460 offers optional Crawl Control, a new technology that helps make driving off-road easier. The Crawl Control feature automatically modulates the throttle and brake, allowing the driver to concentrate on steering. Crawl Control is also useful for helping to free the vehicle from sand, mud or snow. Without canceling Crawl Control, the driver can reduce vehicle speed by braking or adjusting the crawling speed with a selector switch. Standard Hill-start Assist Control (HAC) provides additional control for off-road driving by helping to keep the vehicle from rolling back while starting on a steep incline or slippery surface. Standard Downhill Assist Control (DAC) is designed to augment the low-speed descending ability of the transmission's low range by helping to hold the vehicle to a target speed with no intervention from the driver. Active traction control (A-TRAC) is also standard providing the traction benefits of having locking front and rear differentials, but with lower weight. The system can apply the brake to a slipping wheel, while transferring torque to the wheels with better traction. 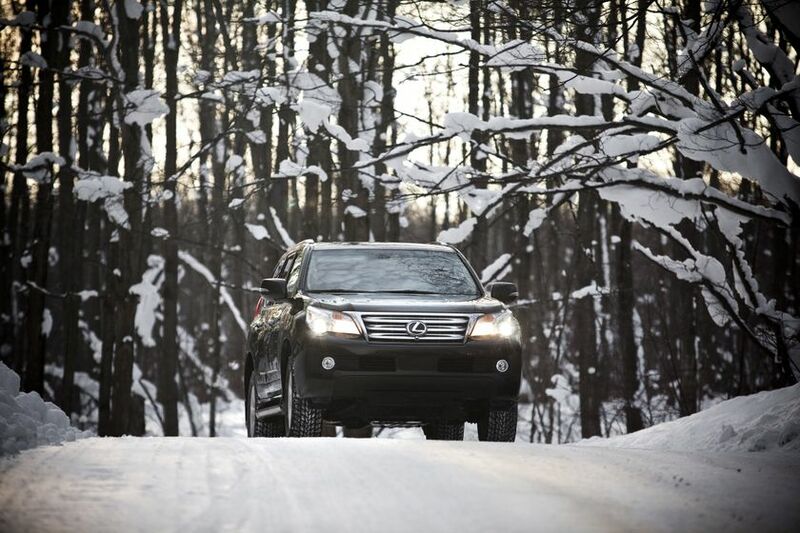 The GX 460, like all Lexus models, is equipped with an array of dynamic standard safety systems. Vehicle Stability Control (VSC) helps keep the GX 460 going on its intended course by detecting front- and rear-wheel slide during cornering and attempting to control either condition with a combination of torque intervention and individual wheel braking. Electronic Brake-force Distribution (EBD) utilizes the anti-lock brake system (ABS) and distributes proper brake force between the front and rear wheels according to driving conditions and wheel-load. The Supplemental Restraint System (SRS) includes a class-leading in the V8 segment standard 10 airbags: dual front and side airbags; driver and front passenger knee airbags; second-row seat-mounted side airbags, and roll-sensing side curtain airbags covering all three rows. The front airbags are designed to inflate according to collision severity. The roll-sensing side curtain airbags are designed to deploy when a severe tilt angle, roll or lateral G-force is detected. New for 2010, active front headrests move up and forward almost instantly in the event of certain lower speed rear-end collisions when the force of the occupant's body is applied to the seat back. Also new, the standard Adaptive Front lighting System (AFS), illuminates a turn or curve as the driver steers into it and includes high intensity discharge (HID) headlights. The new standard Intelligent High Beams with headlamp cleaners automatically adjust the high beams to avoid blinding drivers in oncoming vehicles. The cleaners help ensure optimal headlight performance in all weather conditions. The GX 460 presents a luxurious passenger environment with the fit and finishes expected in a Lexus. Standard features include: eight-way power-adjustable, heated/ventilated front seats; automatic climate control; leather trimmed seats and surfaces; steering wheel audio controls; rain-sensing windshield wipers; power moonroof; a wood and leather-wrapped steering wheel and shift knob; memory system for the driver's seat, steering wheel position and outside mirrors; and an overhead console with integrated HomeLink® transmitter. 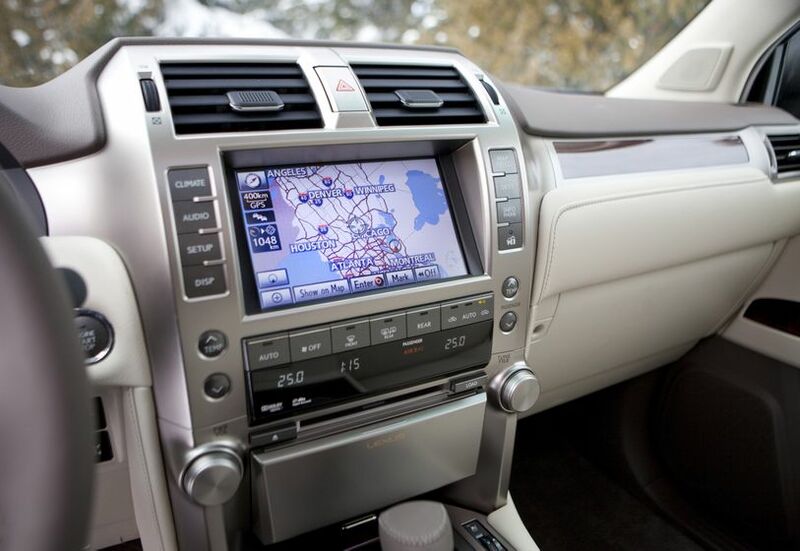 Equipped for family multimedia entertainment, the 2010 GX 460 comes standard with a Mark Levinson 17 speaker audio system with navigation, integrated iPod® control and XM® Radio receiver. Bluetooth® capability includes music streaming and hands free phone. A rear back-up camera is standard on the 2010 GX 460. The camera provides the driver a view of what its lens can detect behind the vehicle when engaged in reverse gear, projecting the image on the standard navigation system’s LCD display. Lexus makes personalizing the GX 460 easy for 2010 by offering a well-equipped base Premium Model and an Ultra Premium Model. The Premium Model includes Smart Key with Push-button start, heated second-row outer seats, three-zone automatic climate control, multi-terrain monitor, conversation mirrors, electrochromic exterior mirrors with power retract, front/rear clearance sonar, and more. 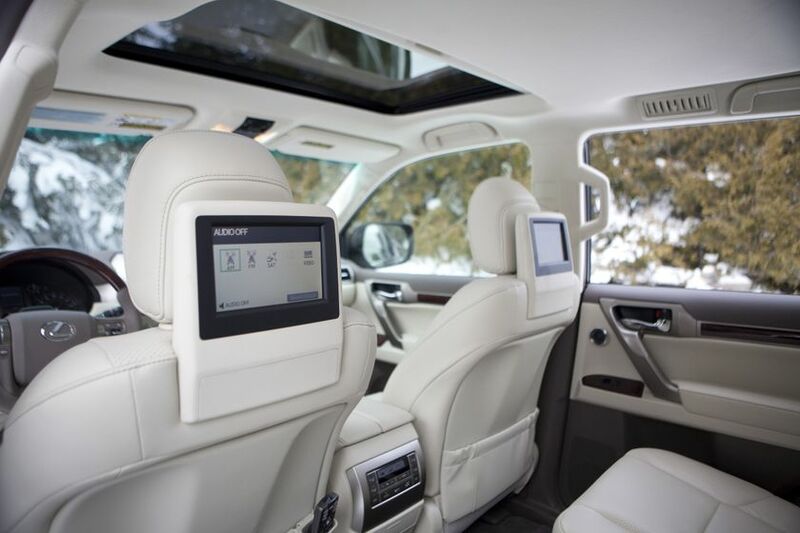 The Ultra Premium Model includes semi-aniline leather; heated wood-trimmed steering wheel and shift knob, dual screen rear-seat DVD entertainment system, lane departure alert, four-camera around-view monitor, illuminated scuff plates, and more. An Off-road Package with off-road guidance is standard on the Ultra Premium Package. The instrument panel is designed to appear as if formed from a single metal bar and is arranged to place all vital controls within easy reach. Electroluminescent instrument gauges are a traditional and functional Lexus design element. Leather-trimmed seat facings, headrests, armrests, door trim, shift knob and steering wheel also add to the Lexus touch. For 2010, expanded wood trim, instrument panel stitching and soft-touch surfaces enhance the luxury feel. The GX offers three interior colors for 2010: Ecru, Black and Sepia. The GX 460 is factory-ready for XM NavTraffic®. XM NavTraffic service offers a complimentary 90-day trial subscription.